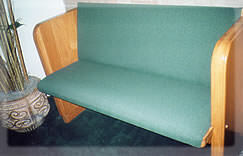 Since the 1970s upholstered pews have become increasingly common. The permanent nature and sleek profile of upholstered seats make them an attractive option. Waggoners can accommodate your needs for quality upholstery service anywhere in the United States and Canada. Pew upholstery is done at your church, with the new fabric and foam directly stapled and glued to your pew seats or backs. In pew re-upholstery, the pews are normally stripped of their old foam and fabric, and new foam and fabric are installed. Our crew can add a permanently affixed seat without interrupting your Sunday services. 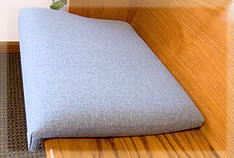 Two inches of quality foam and your selection of fabric make this a beautiful and comfortable addition to your fine pews. For additional comfort, or to cover up unsightly woodwork, consider our matching pew backs. Stapled below your cap rail, the one-inch thick back foam and matching fabric will enhance your entire seating experience. Church pews that are presently upholstered can be recovered by our crew. 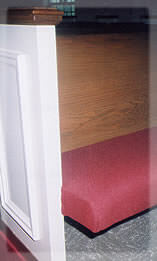 Our representative will first take measurements, examine, and then photograph your pews to ensure a trouble-free job. 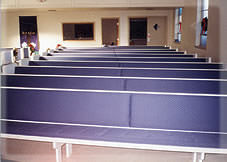 We customize foam thickness and fabric quality based on the original specifications of your pews. The work can be completed at the church or at our plant depending upon your location and needs. When a church is evaluating its seating options many aspects of upholstery need to be considered. For instance, upholstery is a permanent change to your pews. Once you take wooden pews and upholster them it is nearly impossible to change back. With upholstery, foam quality is extremely important. You don’t want to have to get a crew back to the job site to replace inferior foam. Fabric quality needs are heightened because with upholstery you only have one side for wear. Churches considering upholstery truly need a company they can count on. Any warranty work or repairs have to be done on the job site, which inevitably involves travel, which unreliable or unstable companies often will refuse to do. This factory built plywood-based pad resembles pew upholstery but has the advantages of being moveable from pew to pew, and that it does not permanently change or damage your original seating. Velcro strips are key to the easy installation of our factory built backs. 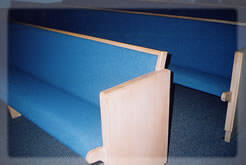 Without permanently changing your pews you can enjoy the comfort of our 3/4-inch thick foam backs.